Automatic printmaking combines the surrealist game “automatic drawing” with a monoprint technique in which you draw on a sheet on paper lying on top of a bank of ink. The pressure of your drawing utensil presses the paper to the ink,“printing” the image simultaneously while you draw. We’re expanding surrealist qualities in this game by using chopsticks as drawing tools to create “invisible lines”. Additionally, we're varying amounts of printing pressure, and adding barriers between the bank of ink and our paper to randomly break up the marks we make. The resulting print can stand as a complete work, or act as the foundation for further image-making. Soft Vase, Charles Woodruff Coates, Ink on paper. Automatic printing bypasses your consciousness in order to create surprising one-of-a-kind prints. “I can’t think of what to draw”. This is the common response I get from participants who want to create art but don’t. Rational thoughts about what to make lead to judgment, constraining the artist from creating at all. To bypass logical judgment, the surrealists employ a variety of automatic systems to free images and words from their binding meaning, punching holes in logic to reveal hidden truths lying within the subconsciousness. Surrealists believe that everyone has the ability to create evocative images when people discard rationale. Because many surrealists games are chain games, this type of art making works best when creating in a group. 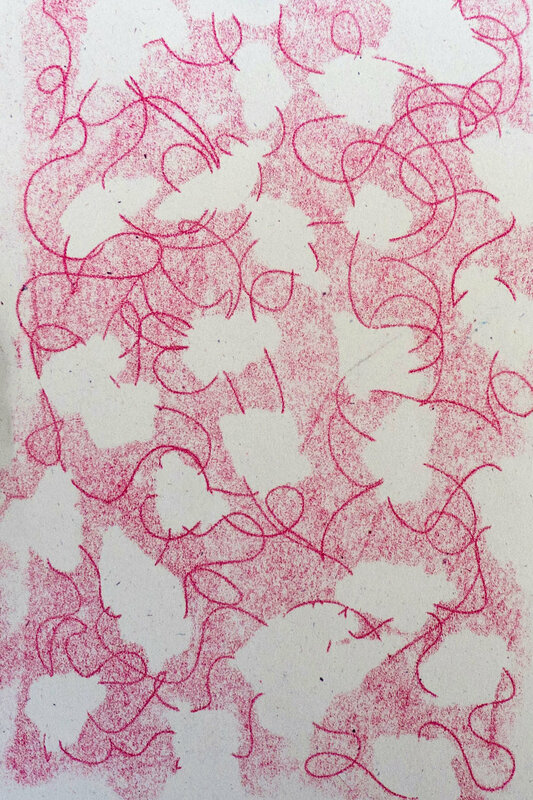 You can manipulate the technical aspects of printmaking in addition to automatic drawing methods for surprising results. Workshop participants roll out Akua Liquid Pigment with a brayer. Create a guide by placing a sheet of French paper beneath your plexiglass surface. Shake up Akua Liquid pigment dispenser. Apply a few drops ( 2-4) on the area of the plexi glass sheet on top of your paper. Roll out the Akua pigment into a think even bank of ink just a little over the size of your guide. Gently place a sheet of French Paper (or any paper of your choosing) over the bank of ink. Place yourself in a receptive state of mind- do not think of any particular subject or outcome of your image. Using your chopstick, begin drawing lines on top of your paper. Keeping your chopstick (or another drawing utensil) on the paper will help with flow. Pressure is a factor - more pressure will result in a darker line, while the lighter pressure will create a softer line. When you’re ready, flip over your paper to reveal your print. Set aside your drawing, or place back down to repeat. You can add even more complex systems to automatic printing by placing barriers between the bank of ink and paper. Try ripping up newsprint and randomly dropping it onto the bank of ink before placing the paper on top for surprising interruptions. Textures like lace can also act as a barrier. Sign up to receive news, art, and projects.